Columbia-TriStar, widescreen 2.35:1/16x9, languages: English DD 5.1 [CC], subtitles: English, single side-dual layer, 28 chapters, production notes, theatrical trailer, talent files, rated PG, 142 min., $24.95, street date 3/21/2000. Academy Awards: Nominated for Best Art Direction-Set Decoration, Best Costume Design, Best Visual Effects, Best Makeup, Best Song-"When You're Alone," 1992. Directed by Steven Spielberg. Starring Robin Williams, Dustin Hoffman, Julia Roberts, Bob Hoskins, Maggie Smith. It always seemed somewhat strange to me that Hook is considered one of Steven Spielberg's "B-list" titles. That meant it was lumped in with lesser-lights such as Amistad, Always and Empire of the Sun. This made little sense to me because Hook actually was quite successful at the box office; it made $120 million, which may not approach the mega-bucks of ET or Jurassic Park but seems substantial enough to warrant a greater profile for the film. Because of this incomparable track record, Hook was supposed to be the big film of the Christmas 1991 season, but it couldn't even take the crown for just the winter; Disney's Beauty and the Beast raked in more than $140 million and left Hook in the dust. Ultimately, Hook only could rise to finish in fifth place for 1991, after BATB, Robin Hood: Prince of Thieves, Terminator 2, and The Silence of the Lambs. That was a pretty dismal fate for a film with such a strong pedigree. All of which proves the old saw about the whole being much less than the sum of its parts. The detail that went into the sets and the entire production design is dazzling; clearly the crew went all-out to create a number of lavish and compelling settings. Overall, the acting really is quite good. Roberts seems fairly flat as Tinkerbell, but Williams does a terrific job as Peter. He takes a surprisingly complex role - since he has to play Peter as older and serious as well as "classic Pan" - and makes all aspects of it realistic and believable; Williams is even able to come across as awkward in a public speaking situation and can deliver jokes in a flat manner, something I would have felt was impossible for him. The film's climax is really pretty well-done. Those kinds of bits are Spielberg's trademark, and he doesn't disappoint as he delivers a finale that gives the affair a rousing conclusion. The ending is a bit over the top, but that's to be expected and actually welcomed in this kind of film. As these past few paragraphs demonstrate, Hook has some positives. Unfortunately, these are heavily outweighed by its negatives, such as the film's length. At more than two hours and 20 minutes, Hook is much too long and it moves at a snail's pace for the most part. Spielberg seems far too concerned with establishing the back story, an issue that seems almost meaningless. The audience is already familiar with most of the characters, and the plot's main twist - that Pan has grown up and become a serious adult - doesn't take an hour to explain. If I was so bored by what was happening during much of the movie's first half, I can't imagine how bad it must be for younger kids. It's pretty clear that by this point in his career, Spielberg was not the same filmmaker he was a decade or more prior to that time. He entered his "serious" stage and simply didn't seem very interested in fun movies. Hook was supposed to mark a return to that territory but all it demonstrated was how far out of touch he had become. He'd regain his talent for the spectacular with Jurassic Park, of course - even its detractors have to recognize what an exciting piece of work it remains, and even its much maligned 1997 sequel (The Lost World) offers some terrific action pieces - but Hook clearly marked the demise of Spielberg's ability to create something along the lines of an ET. And that's too bad, for as good as his straight action films are, Spielberg really excelled at the magical fantasies like ET and Close Encounters of the Third Kind. He hasn't attempted another film of that sort since Hook and I honestly don't think he will; right now Spielberg appears able to invest himself in either exciting action flicks that lack depth or more serious historical pieces and that's it. The Spielberg who made so many of us cry over a wrinkly puppet in 1982 is dead, and Hook acts as the funeral. Okay, that last statement may be overly dramatic, especially because Hook isn't without its charms, especially if you can wade through the cutesy Lost Boys and the film's excess of exposition. Still, it remains a tremendous disappointment. I wanted to like Hook when I saw it theatrically in 1991, and I wanted to like Hook when I watched the DVD in 2000. Unfortunately, there's too little of consequence happening here. The movie has its moments but too few to make Hook anything more than an intermittently fun film. 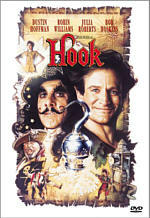 Hook appears in its original theatrical aspect ratio of 2.35:1 on this single-sided, dual-layered DVD; the image has been enhanced for 16X9 monitors. As is typical for DVDs from Columbia-Tristar (CTS), this picture looks very good, a fact made even more admirable due to the complexity of the image contained on the disc. Make no mistake - Hook is a very visually dense film. As I mentioned earlier, the sets and costumes are all quite intricate and packed with details, facts that could have meant disaster. Happily, the DVD displays them all very nicely. Sharpness appears consistently strong and I never noticed even slight amounts of softness or haziness. Moir� effects and jagged edges also seem absent, although I did note some occasional minor artifacts that resulted from the anamorphic downconversion on my 4X3 TV. The print used for the transfer appeared wonderfully clean. I noted no signs of grain, scratches, marks or speckles at any point during Hook. Colors looked very vibrant and lush and displayed full saturation; this aspect of the picture works especially well during the Lost Boys scenes, since they provide many situations with a variety of hues, but all parts of the film show accurate and clean colors. Black levels generally seem very good, and shadow detail usually appears clear and appropriately deep; at times the image can seem overly dark, but most of these instances seem to result from the original film, especially since the majority occur in the low-lit situations at the start of the movie. I expected Hook to look good, but I must admit I was surprised to find that it appeared as clean and sharp as it did. Also fine is the movie's Dolby Digital 5.1 soundtrack. Imaging is generally full and broad, though I must admit I was surprised at how underused the rears were. For the most part, the surrounds provide John Williams' score with little effects on display. That's not a perfect rule, of course, and some scenes present very good effects from the rears, but these don't happen very often. Nonetheless, the overall soundstage seems appropriately wide and engrossing. Stereo usage of the front speakers spreads the image out nicely, and the occasional rear effects add to the impression. Split surround usage is pretty subtle but it's definitely there; I most noticeably detected stereo music from the score. While I liked the soundstage, I was more impressed by the quality of the audio. Across the board, Hook sounds top-notch. Dialogue remains always clear, natural and intelligible, and effects seem realistic and clean. Music sounds particularly good. Williams' score comes across with great clarity and dynamic range; it really pumps out some fine bass. Hook lacks the strong envelopment of newer entries, which required me to bump it down to a strong "B+", but it's nonetheless a very good soundtrack. Much more disappointing are the few supplements found on the Hook DVD. We get the usual (useless) talent files for Spielberg, Hoffman, Robin Williams and Hoskins; CTS create the least-compelling biographies in the business (they can't even be bothered to provide more than a "selected" filmography!). Trailers for both Hook and Jumanji (another Williams film from CTS) appear, and we find some brief but good production notes in the DVD's booklet. Hook remains a film that I really wish I could love but I can only sort of like at best. CTS have produced a DVD with terrific picture and sound; it only disappoints through its paucity of extras. Spielberg fans will definitely want to give it at least a rental, but I can't offer any recommendation stronger than that; Hook occasionally offers a fun diversion but it's generally a dull disappointment.